Dressmaking in a hot and humid climate. My Pattern Pyramid is here! Turned up in the mail a few days ago, and I’ve finally managed to get a photo of it for you all. Isn’t it beautiful? I made it into a sort of pyramid shape with the help of the lovely card Amber from soisewedthis who sent it to me. Although truth to tell, I thought the “Pyramid” part of it was alluding to pyramid schemes – kinda turning the concept into a nice one! But hey, why not two versions of the word? There are some nice shorts/trousers in that Burda mag, otherwise it is full of things like fur-lined cloaks. Hmmm It’s 34C outside at the moment (No idea what that is in farenheit, sorry, but body temp is 36-37C to give you an idea) And 70% humidity. I don’t really want a fur-lined cloak *meep* And that darling vintage-y skirt and blouse is sadly not in my size. I’m really most enamoured of that blouse pattern in the middle of the bottom row. And I’ve got heaps of ideas for what to replace it with. In fact I have so many I reckon I could start up another pattern pyramid myself. In fact, the more I think about it, the more the idea appeals. I will randomly select six winners. 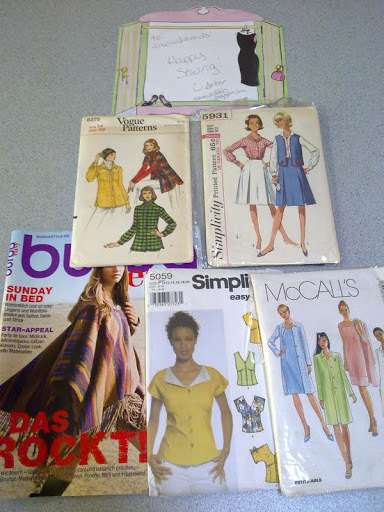 I will post a selection of approximately 5-6 patterns and/or Burda magazines to each winner, along with a generous number of hand woven labels to be sewn into anything made from one of these patterns. You get the idea! 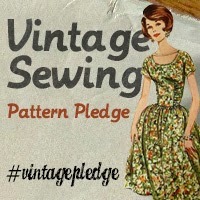 I’m really keen to see how far and wide we can spread the pattern love and I’m intrigued to see who ends up with what. No way am I going through 30 patterns, ensuring that every pattern piece is there. This is pot luck! Please don’t email me for specifics on the 30+ patterns. Take your chance! Your selection of patterns will be picked at random, though I do promise to attempt a good variety of makes. Please don’t contact me asking for specific patterns. I will keep a couple of patterns for myself, because I deserve it. If you’re a winner, I would love it if you could make a small contribution to The Brooke. This is a charity close to the heart of Catherine, who so generously provided these patterns. Finally, if you’re taking part or just want to spread the love, please feel free to add the below button to your blog’s sidebar. Let the fun commence! I bet you have more readers than you realise. I am an incorrigible lurker and only rather random things lure me out. I think I came here via googling the paperbag ensemble dress: trying to find people who had worked with Your Style Rocks patterns! It would be nice to think I did. I do most of my blog-reading on an RSS feed which I don’t think shows up on counters. I’m a bit of a lurker too. Oh yes, that Your Style Rocks dress. It was a great pattern. I was really impressed. Are you thinking of making any yourself? Yes – I have printed out Eva and Paperbag Ensemble. Not sure when I’ll get around to either, but they’re in my future. I do like that they offer the patterns in A0 size for printing! Hey that’s awesome! You have a blog? If you do make them up I’d love to see the end result. Congrats on winning! I’d love to enter please! You’ve got some lovely patterns in your giveaway, please count me in! Ok, you’re in then too! Yes, your temperature sounds far too warm for fur-lined anything although I’m sure the pattern could probably be adapted to something climate-appropriate. But if you don’t want to do that, I’d be happy to! (Or try to.) This is my first time visiting your blog, I think, so I’ll be off to prowl around and get a feel for what you do. Cheers. Ohh please add me to the list! Oh count me in! Congratulations in winning. Thankyou 🙂 Ok, you’re in the draw too! Argh! I totally put labels in there for you! Were there any holes in the package or did customs steal them or maybe they slipped inside one of the patterns or the magazine or the end of the mailing envelope? Glad it mostly arrived! I’ll have an extra-good look for them then. Maybe I missed them. I can’t remember now but I don’t think the package was ripped. Could have just fallen out when I opened it. Oh also I LOVED the big purple ribbon 🙂 So pretty! Found it! YAY! slid down between the couch cushions. First place to look for anything missing in this household! Awesome! My couch also likes to eat things, like my iPod recently! Glad you going them! Count me in please. I’m an Rss lurker too but comment when I can. Hello! *waves* no worries, you’re in the draw too then. Count me in please – I have been stalking the Pyramid for a while now and am still crossing my fingers!